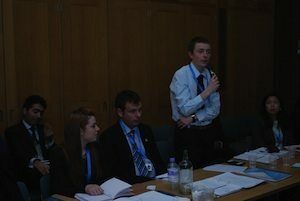 An Australian, an Indian and a Jerseyman rise to speak in the House of Lords… It may sound like the beginning of some bad political joke but I experienced it for real last week at the 5th Commonwealth Youth Parliament in London. Along with 54 other representatives of the Commonwealth, from as far afield as the Seychelles and Samoa, I was honoured to represent my home island of Jersey at a conference dedicated to strengthening understanding of parliamentary democracy and governance amongst young people. Based in Portcullis House in Westminster, we spent a week completing a comprehensive programme of workshops on areas such as governance, the role of the opposition and managing the media, culminating in a debate on education in the House of Lords. On the very first morning we met the Leader of the House of Commons, Andrew Lansley, fresh out of a Cabinet meeting in preparation for George Osborne’s Autumn Statement, who briefed us on the intricacies of the Westminster model of parliamentary democracy. And from then on it was like a conveyor belt of the great and the good of British political life. One moment we were being addressed by Lord Steel, former leader of the Liberal Party, on the challenges faced by small political parties in Britain, the next it was John Bercow, Speaker of the House of Commons, passionately defending his impartiality and the need to make Parliament better serve the people. But I found the real value of the conference lay in the opportunity to get some hands-on experience of life in a legislature and to work with a diverse range of people. We split into two political parties and worked as teams on various projects, such as debating and amending a youth unemployment bill at the committee stage and preparing Ten Minute Rule bills. In defiance of Durham’s Labour roots I decided to join the centre-right party, grandly named the ‘Determination for the Future Party’, and we made up the Opposition. Our task for the week was to hold the Government, the left-of-centre ‘Commonwealth Democratic Alliance’, to account. Our party caucusing sessions in preparation for each task were particularly interesting exercises in cross-cultural cooperation. The fiery Australians and Kiwis would come in all guns blazing, more accustomed to an adversarial and fast-paced style of politics, much to the bemusement of the more dignified and stately African and Asian delegates. Meanwhile the Canadians would be forever questioning points of procedure whilst we small Islanders would limit ourselves to sporadically offering common-sensical suggestions. I confess, I paint a parody, but it’s not far from the truth. Amidst all these strong characters I was somehow elected to the front-bench of our party and, as deputy leader, I had the honour of proposing our opposition motion to create a NATO-like organisation for the Commonwealth in one of the committee rooms off Westminster Hall. It was a personal highlight of the week. But away from the formal programme it was also great to learn about the different political systems and cultures of the Commonwealth from the other delegates. Corruption scandals in Malta, single party rule in Singapore, female marginalization in Pakistan: it was both fascinating and moving to hear of the variety of challenges and problems faced by young people across the Commonwealth. It gave me a sense of perspective for the political ‘problems’ I’d found in Jersey and made me feel immensely grateful that I’d been fortunate enough to have grown up in a stable, prosperous democracy that recognises basic rights and freedoms. In all it was a fantastic experience where I met some great people from across the Commonwealth and learnt an immense amount about politics. It was a privilege to work with passionate young people in such historic surroundings and I’ll forever be grateful for the opportunity. Next Post → Has the European dream become a nightmare?